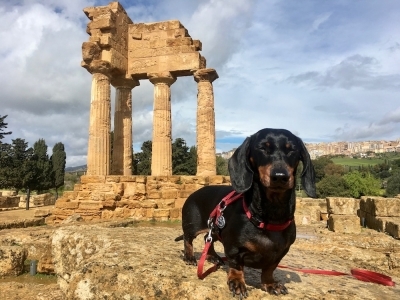 Schnitzel is a Miniature Dachshund from Australia, named after the popular "Schnitzel von Krumm" character from a series of children's books. With a show dog father who immigrated from the UK to Australia at an early age, he was destined to become a world traveller himself. His favourite sites are outdoor ones, where he can roam around and sniff all the interesting smells. Not all sites allow him to visit, but at a surprising number of locations he's charmed his way inside. When not travelling, his favourite pastimes are eating, sleeping and getting cuddles.